I have a fondness for old-fashioned Waldorf salad—chopped apples, celery, walnuts and grapes or raisins dressed with mayonnaise. (Created in 1896 at New York’s Waldorf-Astoria Hotel.) 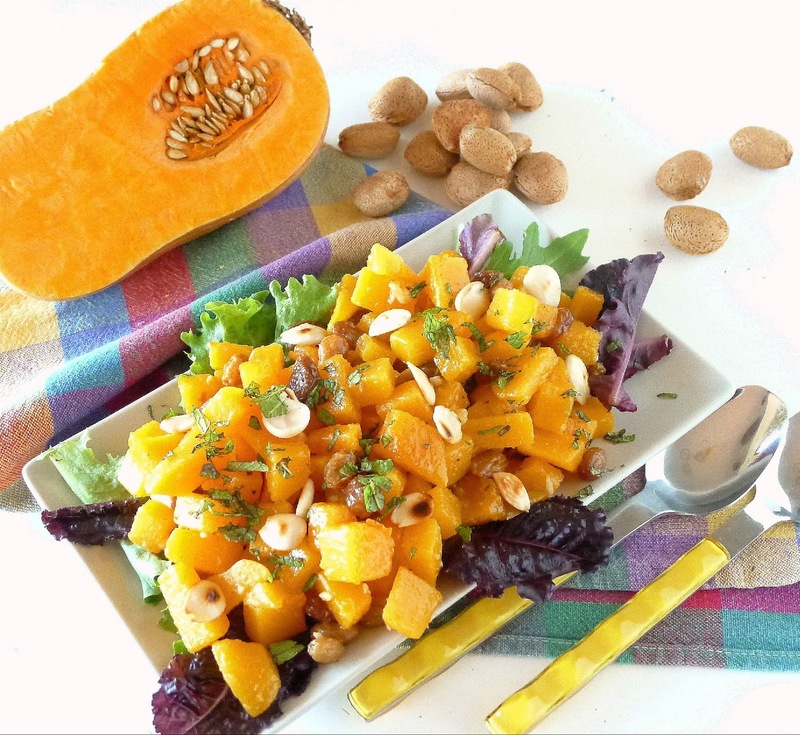 Sweet fruit, something crunchy, pops of color, toasty nuts. It’s just right for fall holidays and holy days. With that in mind, I expanded on the theme, using fruits in season in my own backyard—persimmons, pomegranates, pears and almonds from a neighbor’s garden. A butternut squash from mine. Salads for fall that pop with color: clockwise from the top, persimmon Waldorf salad, cole slaw with pomegranates, spicy squash with raisins and almonds, and pear with fennel, walnuts and grapes. 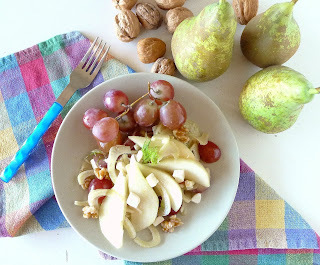 My version of Waldorf salad swaps persimmons for the apples and hazelnuts for the walnuts. 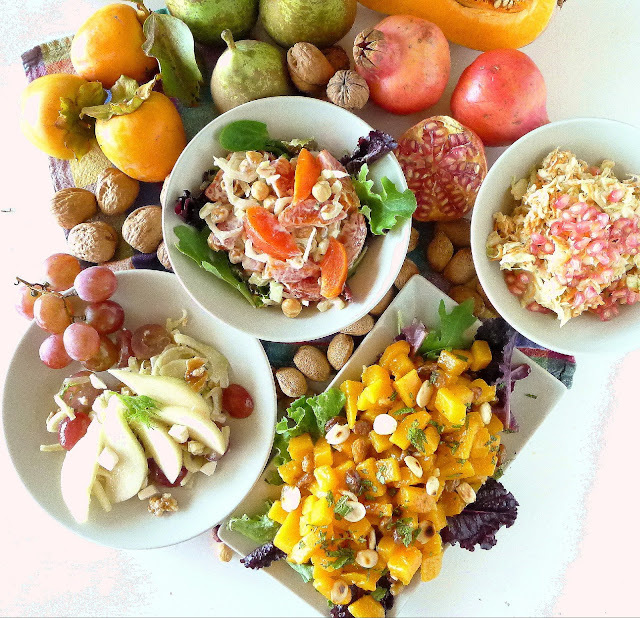 There’s also pear-fennel salad with walnuts, spicy butternut squash with raisins and cole slaw with pomegranates. Any of them could be served, on individual salad plates, as a starter or in a serving bowl as a side dish with roast chicken, perhaps. Ringing changes on classic Waldorf salad: persimmons instead of apples, hazelnuts instead of walnuts. Moroccan spices, raisins and toasted almonds for butternut squash salad. Add pomegranates to a favorite cole slaw. 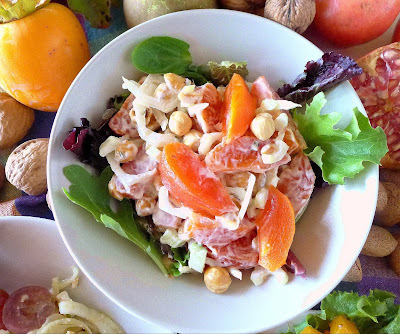 Using quite small persimmons, I sliced them for this salad. Larger fruit could be diced. Place persimmons in a bowl. Add celery and hazelnuts. Combine the mayonnaise and vinegar. Stir into the persimmons. Arrange greens on four salad plates. 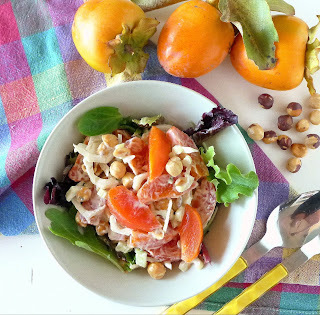 Spoon persimmon salad on top. Raw fennel has a crisp crunch, much like celery. It’s sweet, anise flavor goes nicely with fruit. 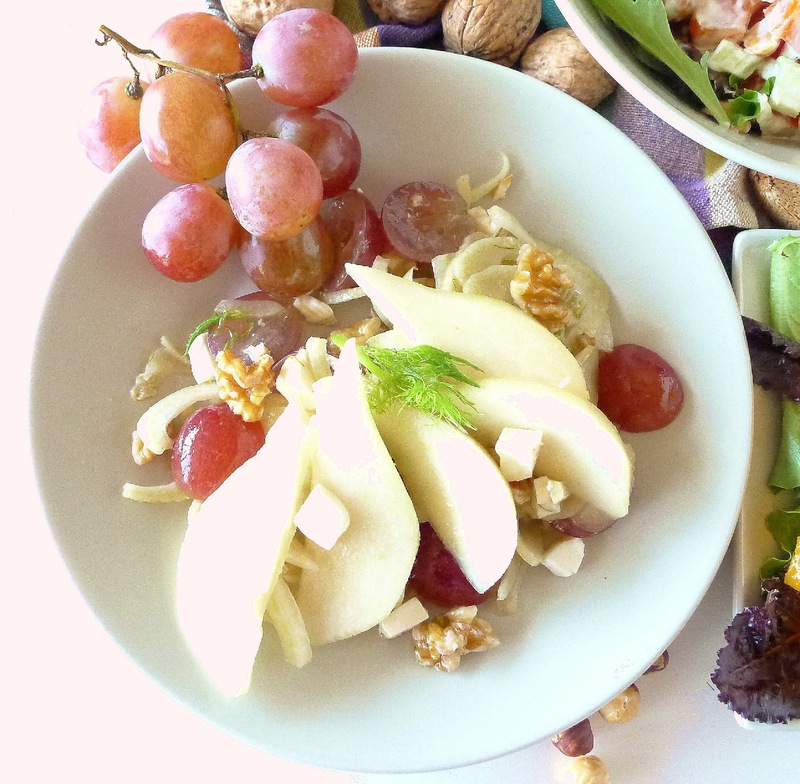 Pair it with pears for this easy salad. If the salad is to be served in a bowl, dice the pears. 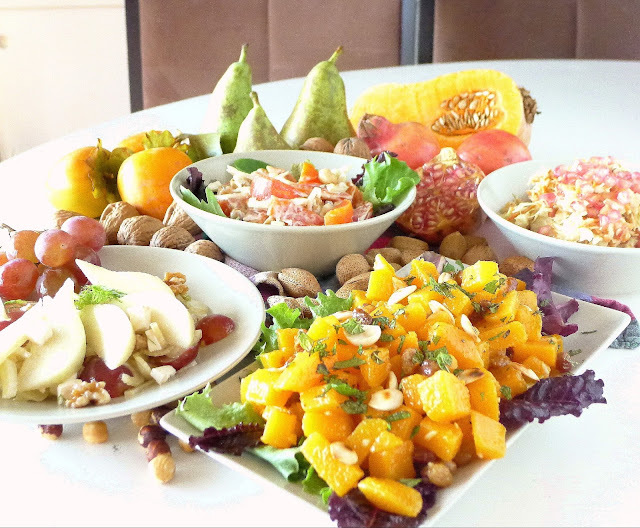 If it is to be served as individual salads, cut pears in half, remove cores and slice thinly. Arrange the sliced pears on top of a bed of fennel on individual salad plates and scatter the diced cheese and walnuts on top. 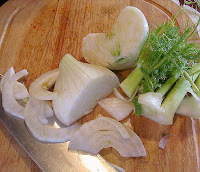 To prepare the fennel: Remove outer layers and discard. Cut off ferny green tops and reserve some for garnish. Cut the fennel bulb in half lengthwise. Cut out the core, then place it cut-side down and slice crosswise very thinly. Place the pears in a small bowl and squeeze lemon juice over them. Place the sliced fennel in another bowl. Add the oil, vinegar and salt and pepper and toss well. Add diced cheese, walnuts and grapes and combine. To serve in a salad bowl, add the diced pears to the fennel and combine gently. To serve on individual plates, divide the fennel with cheese and walnuts between salad plates and place sliced pears on top. Garnish the salad with a snippet of the green fennel leaves. This makes a nice side dish with a holiday meal. Serve it room temperature. Take care to not overcook the squash. Bring a pan of salted water to a boil. Add the diced squash. Bring the water back to a boil and cook the squash 1 ½ minutes. Add raisins to the pan for 30 seconds and drain. Place the squash and raisins in ice water to stop the cooking. Drain again. 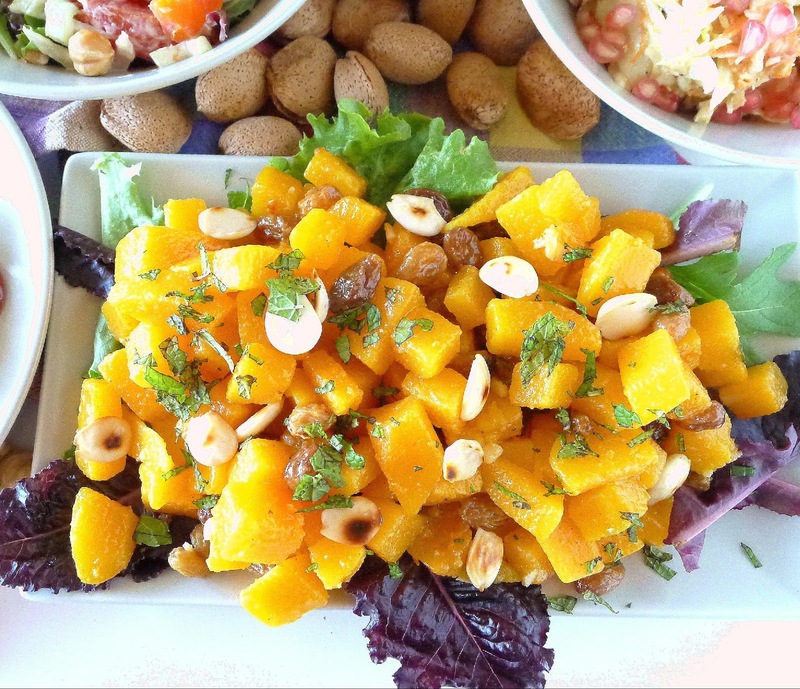 To serve, spread the squash on top of salad greens on a platter or shallow bowl. Sprinkle with almonds and chopped mint or cilantro. On a fall trip through Extremadura, (western Spain), I found salads everywhere--of lettuce, mixed greens or cabbage--garnished with the ruby-red seeds of the pomegranate. Not only beautiful to look at, they add a sweet-tart crunch. The Spanish version of cole slaw is made with a dressing of fried slivered garlic and pimentón (paprika) and topped with pomegranate seeds. 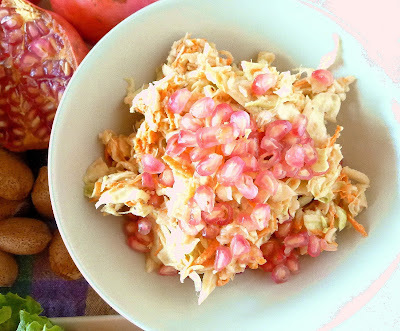 However, you could add pomegranate seeds to any favorite version of cole slaw. Or, try the following recipe, with pomegranate molasses, a sweet and sour syrup to be found in Middle Eastern shops (or use honey plus lemon juice). Combine the shredded cabbage and grated carrot in a bowl. Sprinkle with salt, mix well and let stand for 30 minutes. In a small bowl whisk together the yogurt, oil, vinegar, pomegranate molasses and celery seed. Add to the cabbage and combine well. Add half of the pomegranate seeds. 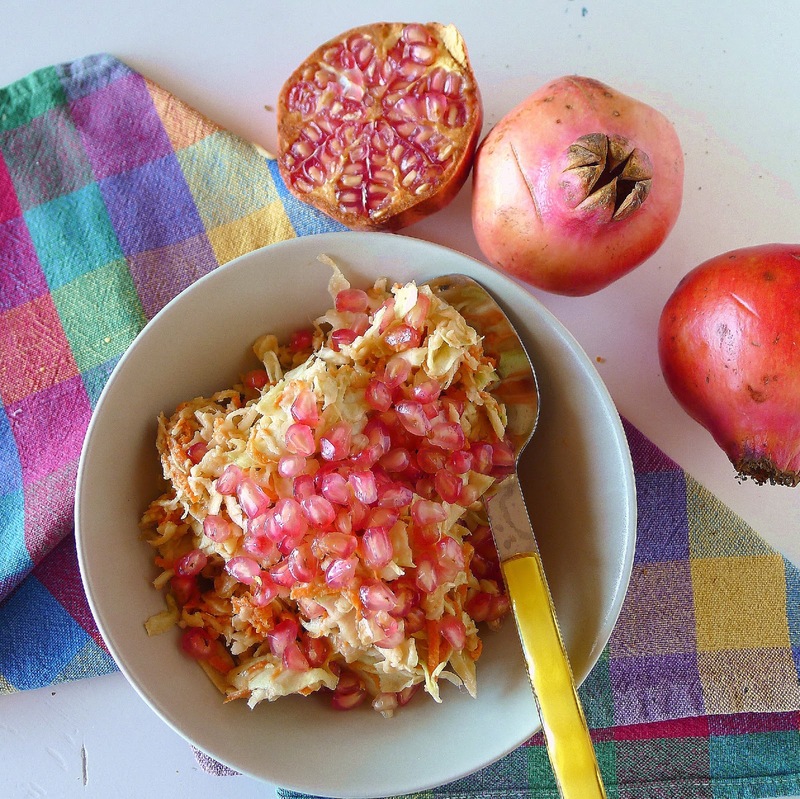 Serve the slaw in a bowl with remaining pomegranate on top. Pork tenderloin with pomegranate sauce. Chicken braised in spiced grape juice. Green bean salad with grapes. Patty: I think I'll serve the persimmon salad as a starter for Thanksgiving. Hope you enjoy them.